I, João Carlos da Silva, in the capoeira world better known as Contra Mestre Macumba, started capoeira on the 17th of august 1989 at “Academia Ritmo Brasil” of Mestre Cicero at my hometown Campinas, São Paulo. After two years of training this academy turned into Cordão de Ouro, where I had a big part of my schooling (12 years). Mestre Cicero has been a big part of everything I know and am. I’ve always been a big fan of the capoeira style from Rio de Janeiro in the years of 2001 and 2002. At that time I went to Centro Cultural Senzala. Here I found the style which I was looking for, and which I’m very happy with. After a long route in capoeira with victories and new friendships I went to live in Brasilia - DF. Here I got to know Grupo EBC (Escola Brasileira de Capoeira) of Mestre Oscar where I had an excellent experience of family and companionship. I arrived in Europe in 2007 and in 2010 I felt a necessity to create a group with all the good characteristics that I have learned in the long 21 years of capoeira at that time. 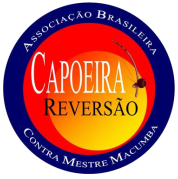 Today with much pride I am responsible for Associação Brasileira Capoeira Reversão.